Natural ventilation. How do I get the most out of it? – Green It Yourself Now! Natural ventilation. How do I get the most out of it? 9 Comments on Natural ventilation. How do I get the most out of it? 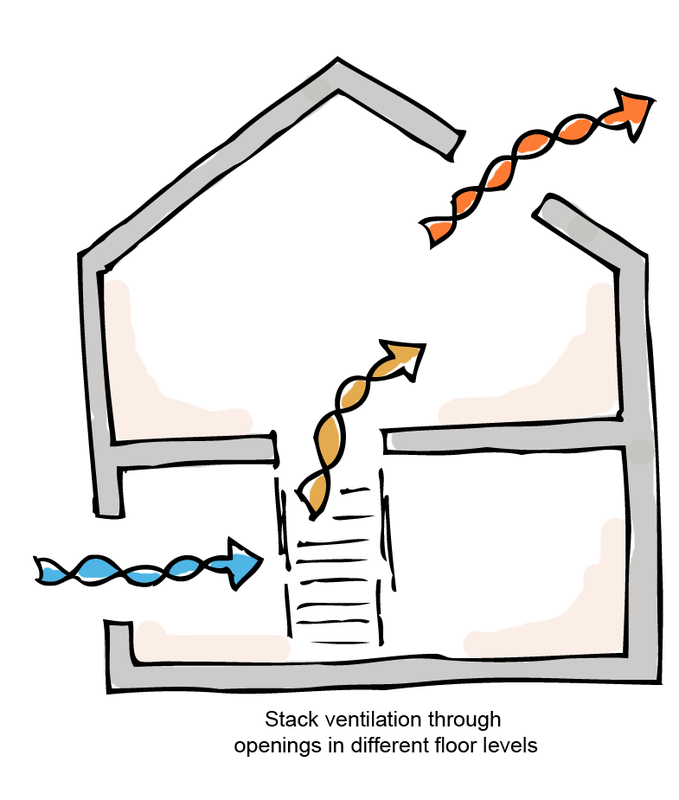 Natural ventilation is the process of air entering and exiting an internal space without the use of any mechanical system. 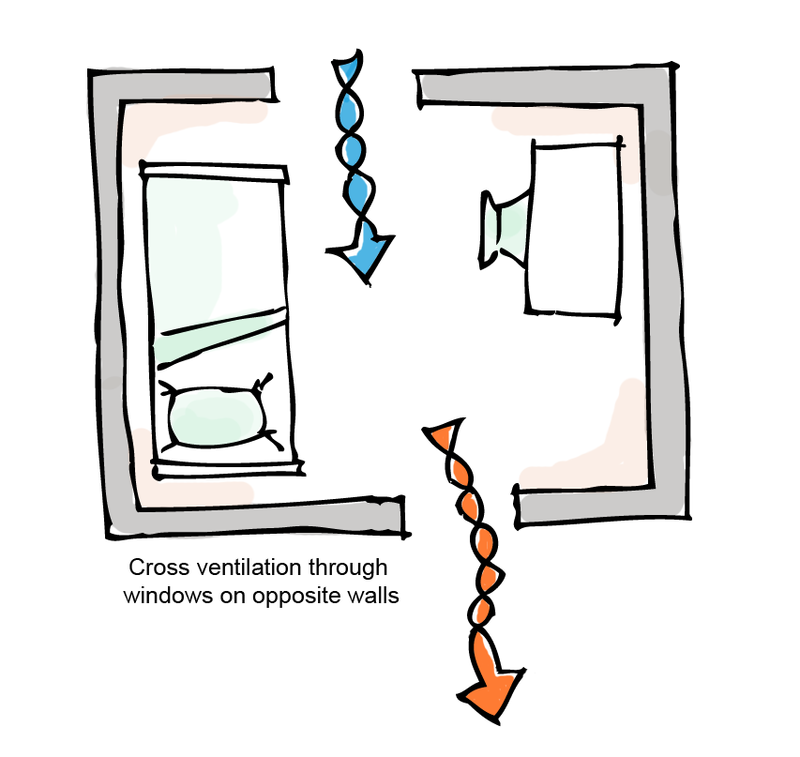 It happens naturally due to outside air movement and pressure differences between outside and inside spaces. Windows and other openings within your home can provide natural ventilation; and the way you use these openings will differ depending on the season. Summer is the season in which you will need the highest amount of natural ventilation in order to keep comfortable temperatures inside your home. There are clever ways to boost natural ventilation and avoid the use of air conditioners or even fans. 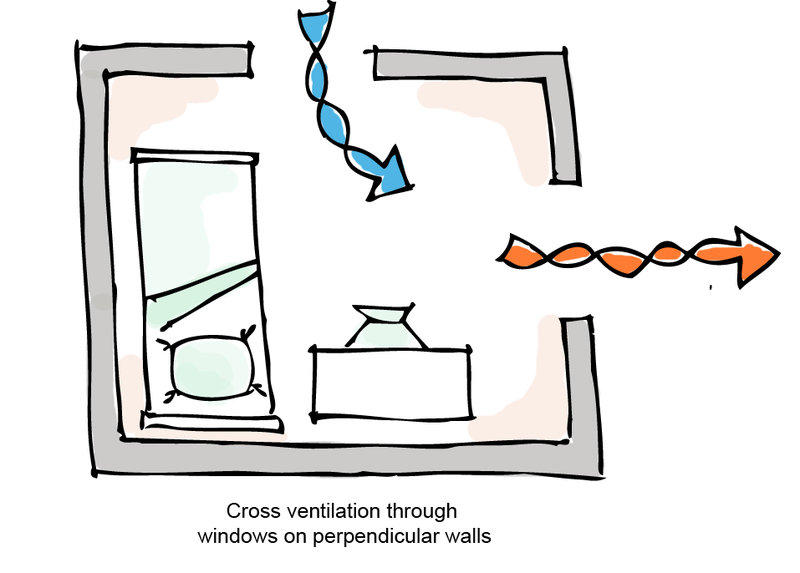 If your house has windows placed on opposite or perpendicular walls you can benefit from cross ventilation by opening these windows at the same time. 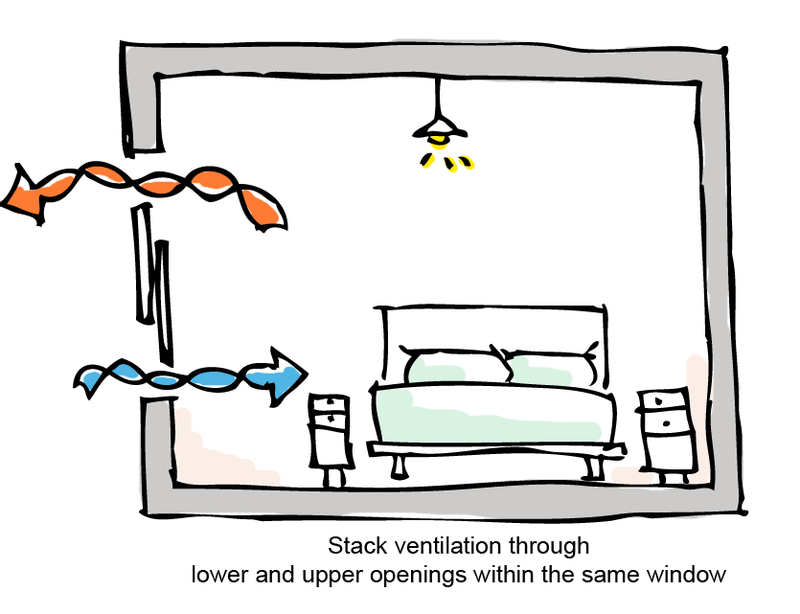 Additionally, if your home has more than one floor, you can open windows at the upper and lower level in order to benefit from stack ventilation (hot air naturally rises and leaves through upper level windows while rapidly dragging more air in through the lower level ones). This will facilitate airflow and increase air speed considerably, making the spaces feel cooler. It might be that you live in a single aspect flat (you have windows in only one side of the building) and this will make it a bit more difficult to boost the natural ventilation of your home but there are some things you can do. If your windows have an openable panel at the top and another at the bottom, the same stack effect mentioned previously will happen to a lesser extent with warm air going out through the top panel while dragging more air in through the bottom one. 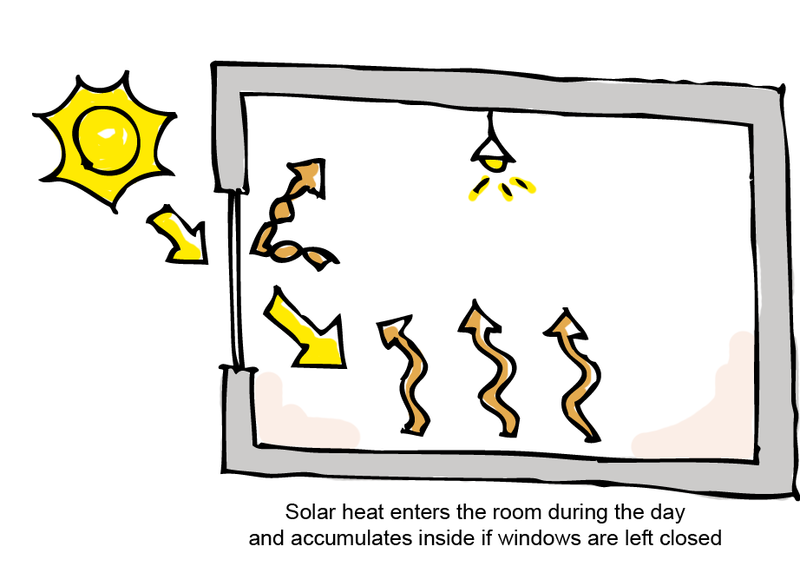 You can also leave your windows slightly open during the day when you are out in order to avoid the build-up of heat – heat from the sun will constantly pass through the windows during the day and accumulate inside if windows are closed. Additionally, you can leave your windows open overnight, when temperatures are lower, in order to cool the space. In winter it might be more difficult to ventilate your home properly via the windows since the temperature outside will be lower than inside. It is not desirable that too much cold air enters your home as it will reduce internal temperatures and require additional heating to bring them back to comfortable levels. However, a minimum amount of ventilation will be necessary in order to guarantee adequate provision of fresh air and remove humidity. Failing to do so may cause health problems to your family and mould growth around the house. There are ways to ventilate your home naturally in winter that will prevent a considerable amount of hot air from escaping the house and avoid draughts. 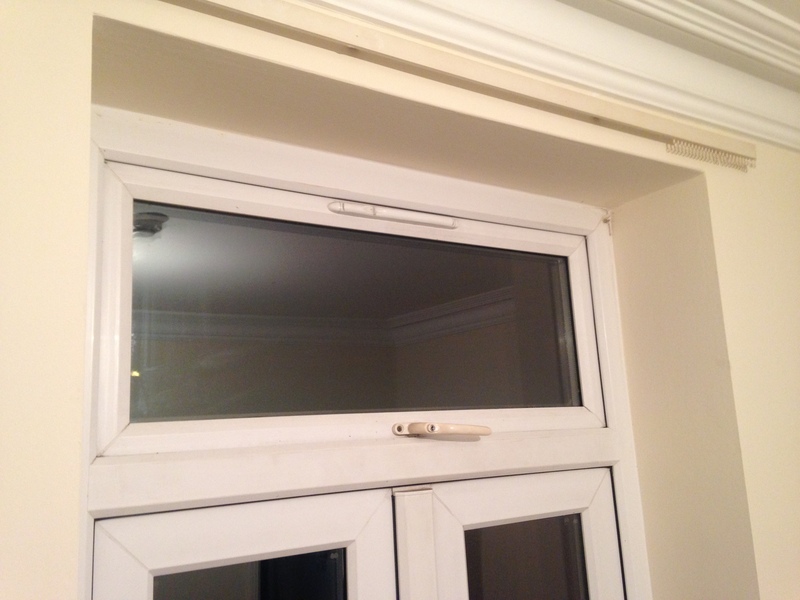 Some windows benefit from devices called trickle vents; these are very small ventilation grilles that are integrated to the window frame and can be closed and opened when necessary without the need open the windows. Other windows benefit from ventilation locks that allow you to have your window as little as half a centimetre open while still locked. Leaving them open for a few hours a day, maybe while you are out of the house, should be enough to renovate the internal air. Have a look if your windows benefit from any of these features and use them; if they do not, you can purchase and fit them to your windows. Trickle vents and ventilation locks are widely available on the market and are cheap and easy to fit. Good ventilation in your home is essential to guarantee a comfortable and healthy environment for your family. Remember that the way you use your windows will differ in cold and hot seasons and it is important to use them correctly, as this will also save you money on bills! Are you using your windows correctly? Are you greening it? Green It Yourself… Now! My home is on the top floor and I need to follow some measures for ventilation, cooling and insulation. Your article will be of help indeed. I am so glad you found our post useful! Thanks for sharing your post on fans with us, that’s great! Another problem you can have with short rods for fans in very high ceilings is that if the fan is too far away from the occupied area of the room people cannot feel the air movement on their skin and consequently cannot feel the refreshing benefits of the fan. Hope to see you around again soon! yes – you are right – you got it well understood. Pingback: Window performance for summer comfort – Green It Yourself Now! 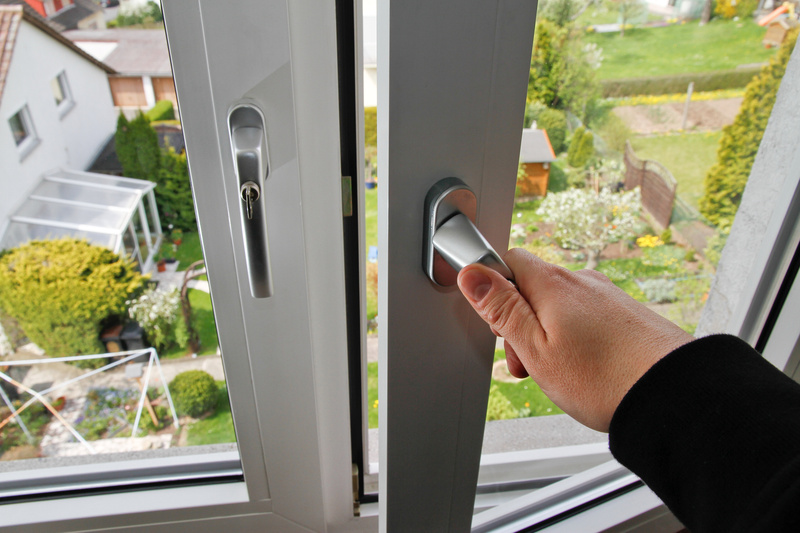 Pingback: How to draught proof your windows – Green It Yourself Now! Pingback: Stop loosing heat through your chimneys – Green It Yourself Now! Pingback: Why you should avoid furniture with formaldehyde – Green It Yourself Now! Pingback: How to improve air quality in your home – Green It Yourself Now! Pingback: 5 tips to increase comfort in your home this summer – Green It Yourself Now! Previous Entry Water conservation. How can I help? Next Entry Recycling. How can I reuse resources and waste less?